This sweet little stitching pattern dates back to 1871. It was included in a wonderful little booklet of Russian Folk Ornaments. The Russian chicken pattern, as I’ve dubbed it, is fairly quick and easy to stitch. I worked it on regular 14 count Aida cloth using 2 x 2 squares. I used two strands of a six strand embroidery floss and it took about only one length of thread (it might have been 24 inches or so, sorry didn’t measure it). I think the pattern is simple enough that you could probably stitch it up on any sort of cloth. My cloth was a bit thicker than standard Aida cloth. 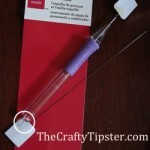 That allowed me to stitch it without needing a hoop – yay! It was a scrap I had in my stash but I think it might have been Oatmeal Fiddlers Cloth. The chicken on the left has the tail and wing done with long stitches and the one right was done with all individual stitches along the longer lines. 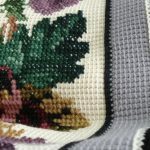 The decision on which technique to use is yours but I would recommend only using the long stitches on a piece that will be stretched and framed. They just don’t lie as nicely as the short stitches if the fabric isn’t pulled taut. 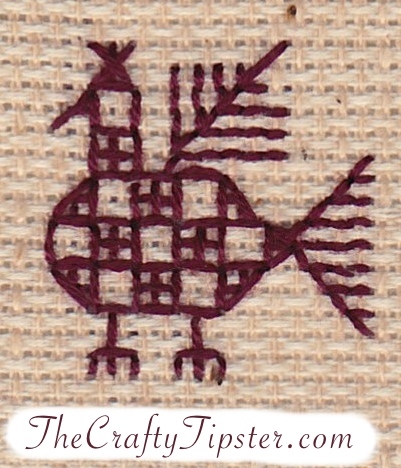 The original Russian chicken pattern showed these charming birds stitched in a row with a scalloped line below. It was clearly designed to be a repeating border. They did their birds all in a row like I did. It might be cute to alternate which way they face and stitch them in pairs of birds facing each other. I love these simple little stitch designs of eastern europe. My husband is Ukranian and we have numerous items similar to this around the house. I’m not Ukranian but, I do like these charming folk cross stitch patterns too. Sorry for the late reply. I’ve had a rough year. Glad I found your comment. 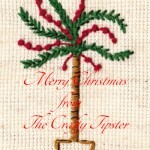 I’ll see if I can post a few more of these in time for Christmas. I like these simple little stitch designs of eastern europe. 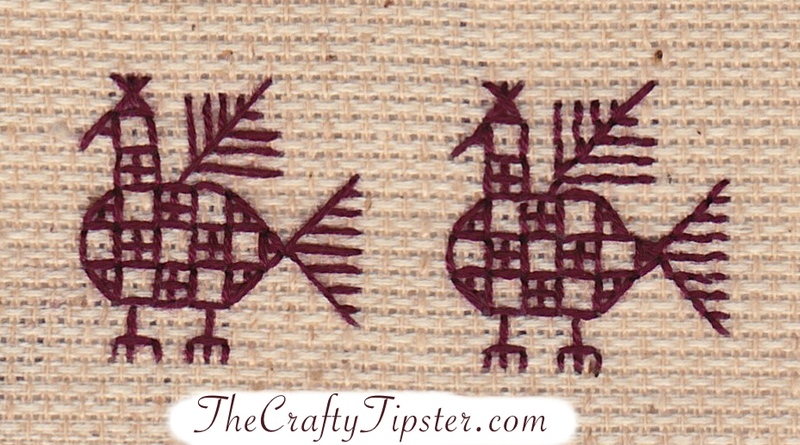 Wow, these are simple and elegant little chicken stitches. I thought folks would enjoy them. So much charm in so few stitches. Thanks for taking the time to let me know you enjoyed them.